Our Copper-Nickel Ingot comes in standard 60:40, Copper:Nickel ratio. It is used in a variety of industries from, making electrical switches to minting coins. We supply it throughout the country. We can also make different Cu:Ni based alloys if need be (contact us). We deal in variety of copper-nickle alloy scraps, in different grades. 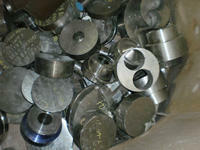 These are available in various forms including turnings, solids, powders or as component of any machinery. All these scraps are offered as per client's specifications & we ensure timely delivery of orders. Our copper and copper alloy scraps are not contaminated and are suitable for simple remelting. We trade in diverse range of nickel scrap available in different grades and forms including turnings, solids, powders or as component of any machinery. All these scraps are procured as per client's specifications from the reliable sources across the country.